Welcome to a Holy Spirit painter's world! Glad you dropped in. Here are images to enjoy, and I'd love to connect personally with you afterwards! Some of the paintings are available, as well as books, prints and cards. 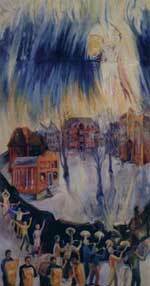 About 15 years ago, after being a landscape painter for many years, I started painting a few works based on images in that incredible and mystifying last book of the Bible, Revelation. Soon I was definitely into a series. At first it was one or two a year, then it evolved into a full-time preoccupation, and finally an exhibition. Since 1990, I have been creating what I call "God Works" and started writing some commentary, and lately, poetry, to accompany them, into a three ring binder. That evolved into publication of two books the year of 2002. The Holy Spirit was very involved in this process. As imagination and outcome were yielded to Him, He taught me and definitely inspired the words and text, as He had informed the paintings in watercolor, oil and acrylic. Lately, painting in watercolor at gatherings, conferences and in my home church has brought new and more prophetic forms, freer expression and more rainbow-like colours. Prince Edward Island is a jewel in itself, and our family moved here in the early sixties, and have lived, for the main part, in a rural area. Our one storey house is surrounded by potato fields and woods, grazing animals in rolling fields, which are lined by sentinel spruce trees. Not far away are miles of beaches. We brought up three children here and have five grandkids. PEI reminds me of rural Pennsylvania where I spend much of my childhood. I look forward into the future and see many creative people giving glory to God in their work, networking and supporting one another, until a symphony of voices join the host of angels surrounding us, in a wonderful celebration of God's love.